... Certificate n° P/094/06 Twin hull in reinforced polyester fibreglass Passenger seat block moulded in polyester Helm is a steering wheel connected to stainless steel components. ... Trio is selfscudding. It is possible to mount railings at a later date to make embarking easy. 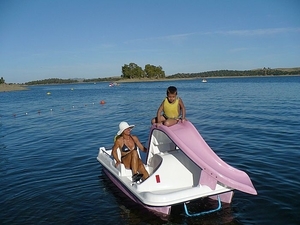 A fun and different country boat that gathers the family together for joint activities. Pedal-boats are leisure crafts propelled by wheel blades activated by a crankset. Beach resort businesses often rent pedal-boats to tourists and children for short sport, ecological or leisure cruises. They are particularly suited to calm waters, lakes and sheltered water bodies. Most models only use muscle-force for propelling. Some units, however, feature a small auxiliary electrical motor. "Water bikes" can be used as bicycles. Their users are seated on saddles instead of on bucket seats. Many models are catamarans (double hull), for stability reasons. They can be made of plastic (polyester, polypropylene, polyethylene, etc.) or of aluminum. Some feature toboggans and/or ladder-equipped diving platforms. Children models can take the shapes of cars, pelicans, dragons, etc. The number of seats is the main element to consider. A Bimini (a sun protecting canvas top) is very useful in especially hot areas.